When we decide to train a cool machine learning model, the most common machinery to get us there is stochastic gradient descent. From its humble beginnings as “cheapskate gradient descent”, SGD blows away its vanilla counterpart on highly non-convex loss surfaces. To me, the fact that such a simple hill-climbing technique has dominated modern non-convex optimization is fascinating. However, the presence of spurious local minima and saddle points makes analysis more complex. It’s important to understand how our intuitions about SGD dynamics can change when we remove our classical convex assumptions. The jump to the non-convex setting invites the use of frameworks like dynamical systems theory and stochastic differential equations, which provide models for thinking about long-term dynamics and short-term stochasticity in the optimization landscape. Today I will be talking about what appears at first to be a simple nuisance in the world of gradient descent: noise. The only difference between stochastic gradient descent and vanilla gradient descent is the fact that the former uses a noisy approximation of the gradient. The structure of this noise ends up being the driving force behind the “exploratory” behavior of SGD for non-convex problems. I’ll talk a bit about the structure of this noise, connect it with some ideas from information geometry and stochastic nonlinear systems, and conclude with a discussion on some practical implications for these results. Let’s introduce our problem setup. Suppose I would like to minimize a loss function with a finite dataset consisting of examples. For parameters , I will call the loss on the th example . Now, is presumably quite large, so we’ll estimate the dataset gradient with a mini-batch estimate , where is a mini-batch of size . Although is itself a noisy estimate of , it turns out that mini-batch sampling produces an estimate with an interesting covariance structure. What does this result mean? Well, let’s put ourselves in-context. In a lot of optimization problems, our underlying goal is to maximize the likelihood of some configuration of the parameters. So our loss is a negative log-likelihood. For classification problems, this is cross-entropy. In this case, the first term is an estimate of (minus) the covariance of the gradient of the log-likelihood. This is the observed Fisher information. As , this approaches the Fisher information matrix. This is precisely the Hessian of the relative entropy (KL divergence). But the KL divergence is a constant factor away from the cross-entropy loss (negative log-likelihood) we were attempting to minimize. Hence, the covariance of mini-batch noise is asymptotically related to the Hessian of our loss. In fact, when approaches a local minimum, the covariance approaches a scaled version of the Hessian. Before I continue a bit into SGD-specific analysis, let’s take a moment to consider the connection between the Fisher information matrix and the Hessian . is the variance of the log-likelihood gradient. How does variance relate to the curvature of the loss surface? Suppose we’re at a strict local minimum of , i.e. is positive definite. induces a metric called the Fisher-Rao metric near : . Interestingly, the Fisher-Rao norm of the parameters provides an upper bound on the generalization error. This means we can be more confident about the generalization ability of flatter minima. Lemma 2: Let be a random vector with mean and covariance . Then . Micro-theorem 1: the radius of stability for a strict local minimum is inversely proportional to the spectral radius of . Let’s connect this to what we know about the Fisher information. If flatter minima are more stable under the dynamics of SGD, this means that SGD implicitly provides a form of regularization. It does this by injecting anisotropic noise to push us out of regions where the Fisher-Rao norm hints at unfavorable generalization conditions. An interesting phenomenon within deep learning is overparameterization. We often have many more parameters than we do examples (). In this case, is highly degenerate, i.e. it has a lot of zero (or near-zero) eigenvalues. This means there are a lot of directions along which the loss function is locally constant. This paints an interesting picture of the optimization landscape for these networks: SGD spends most of the time traversing “wide valleys.” The noise is spread out along the few directions of higher curvature, which counteracts ’s push towards the bottom of this valley. Since we scale by a factor of before adding it to our vanilla gradient, increasing the batch size scales down the overall variance of our mini-batch estimate. This is a problem, since large batch sizes enable faster training of models at scale. 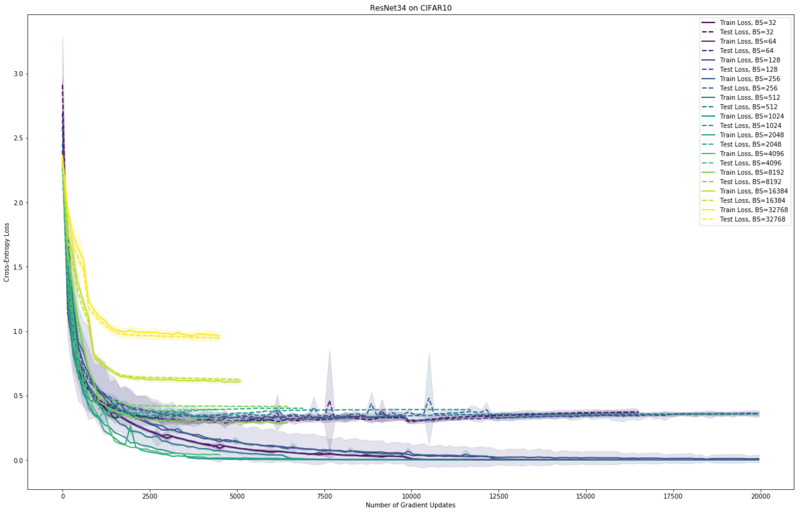 It’s faster in two important ways: training error tends to converge in fewer gradient updates, and large batches let us take advantage of data parallelism at scale. However, increasing the batch size without any tricks can cause the test error to increase. This phenomenon is known as the “generalization gap” and there are a few working hypotheses for why this might be the case. One popular explanation is that our “exploratory noise” is no longer powerful enough to push us out of the basin of attraction of a sharp minimum. One solution is to simply scale up the learning rate to increase the contribution of this noise. These scaling rules have been pretty successful. Most of the proposed solutions to deal with sharp minima/saddle points revolve around (a) injecting isotropic noise or (b) maintaining a particular “learning rate to batch size” ratio. I don’t think these will be enough in the long-run. Isotropic noise does a poor job of taking into account the “wide valley” structure of our loss landscape. Increasing the learning rate also increases the contribution of the vanilla gradient, which makes our weight update bigger. I think the right approach is to come up with efficient ways to simulate the anisotropy of mini-batch noise in a way that’s “decoupled” from the learning rate and batch size. There are efficient ways to do this using sub-sampled gradient information and the Hessian-vector product, which I’m experimenting with right now. I would love to hear other ideas on how to solve this issue. In the meantime, there’s a lot of theoretical work to be done to understand these dynamics in more detail, especially in a deep learning context.